MOSCOW (AP) By starting its World Cup with a win, Senegal also saved Africa from embarrassment in the tournament. The continent was facing the prospect of a worst-ever World Cup start before Senegal beat Poland on Tuesday. The 2-1 victory was the first and only African win in the first round of matches, after Egypt, Morocco, Nigeria and Tunisia all lost their opening games. A few hours after Senegal’s win, Egypt then also lost its second match, 3-1 against Russia. As in 2002, when Senegal beat then-defending champions France in its opening match, it now hopes to build on the momentum. But coach Aliou Cisse said beating the Poles didn’t have the same history-making feel of the 1-0 victory in 2002 against the French, Senegal’s former colonial masters. From there, in what was its first and until now only World Cup, Senegal went on a run to the quarterfinals. Not since 1974 – when Zaire, its only representative, lost all three of its matches, conceded 14 goals and scored none – had Africa been without at least a win or a draw in the first matches. Since the World Cup expanded to a 32-team format in 1998, the worst opening round for African teams was in 2006, when Ivory Coast, Ghana, Togo and Angola all lost their first matches and Tunisia drew 2-2 with Saudi Arabia. Compounding the worries for African supporters is that, aside from Senegal, the continent’s five teams largely aren’t scoring. Egypt, Morocco and Nigeria didn’t get off the mark in losing their opening matches to Uruguay, Iran and Croatia, respectively. Tunisia’s goal in its 2-1 loss to England came from a penalty. Mohamed Salah, Egypt’s star striker, also scored from the spot on his return Tuesday to the team following his left-shoulder injury in the Champions League final in May. The only African to score from open play so far in Russia is Mbaye Niang, who pounced on an appallingly judged and executed Polish back pass to net Senegal’s second goal at Moscow’s Spartak Stadium. The other two goals in the match were both scored by Poles. Defender Thiago Cionek deflected a shot off his right calf past his own keeper, an own goal that gave Senegal the lead. Grzegorz Krychowiak headed in Poland’s late consolation goal. 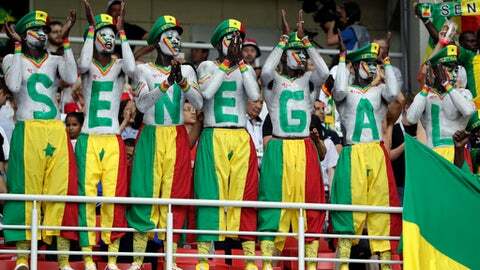 Although contesting only its second World Cup, Senegal could end up carrying the hopes of all Africa if the continent’s other teams don’t quickly pick themselves up. Morocco faces a tough task against Portugal and Spain in Group B. Nigeria has to play Argentina and resilient Iceland in Group D. Tunisia has the more manageable Panama but a tough match against Belgium in Group G. Egypt’s second-match loss to Russia severely compromised its chances of getting out of Group A.
Senegal’s next opponents in Group H are Japan and Colombia.